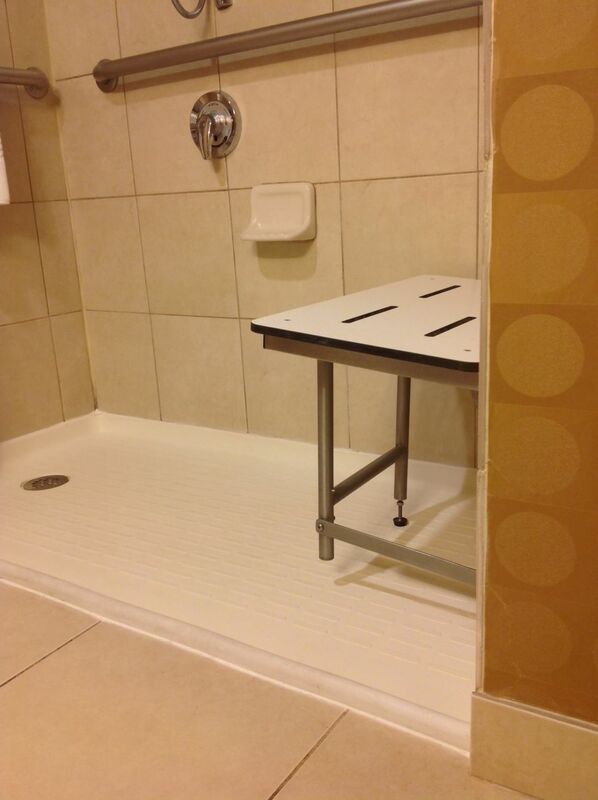 On a recent business trip in Worthington suburb of Columbus Ohio I was staying at a DoubleTree Hotel and was registered in a handicap accessible room – even though I don’t have a personal challenge which requires this particular space. 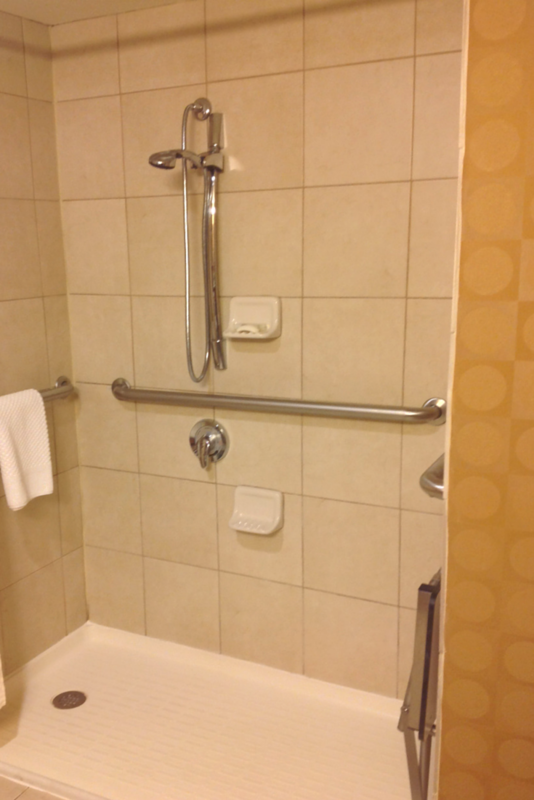 As someone who studies universal and accessible design principles (I am a Certified Aging in Place Specialist) and who recommends these products (I am the President of Innovate Building Solutions – a nationwide wholesaler and regional installer of universal and accessible bathroom products) the opportunity to stay in this room gave me a chance to evaluate the bathroom – and the shower in particular. While the overall shower and bathroom was adequate – it most certainly can be improved with more thoughtful design and/or different product selections. 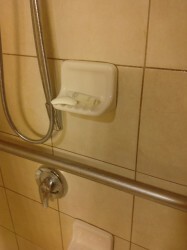 In the article below I’ve identified 7 ideas to improve the function (for hotel guests of all abilities), looks, and lessen the longer term maintenance of this particular DoubleTree hotel shower. 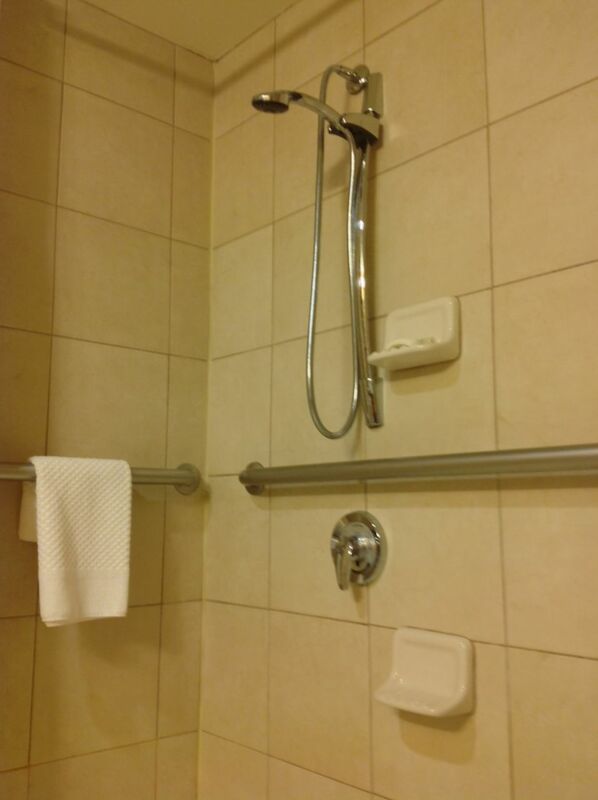 Idea 1) Add a stationary shower head – As a 6’ tall guy who is not in a wheelchair having to bend over to rinse my head when using the hand held shower in the carriage was a pain. 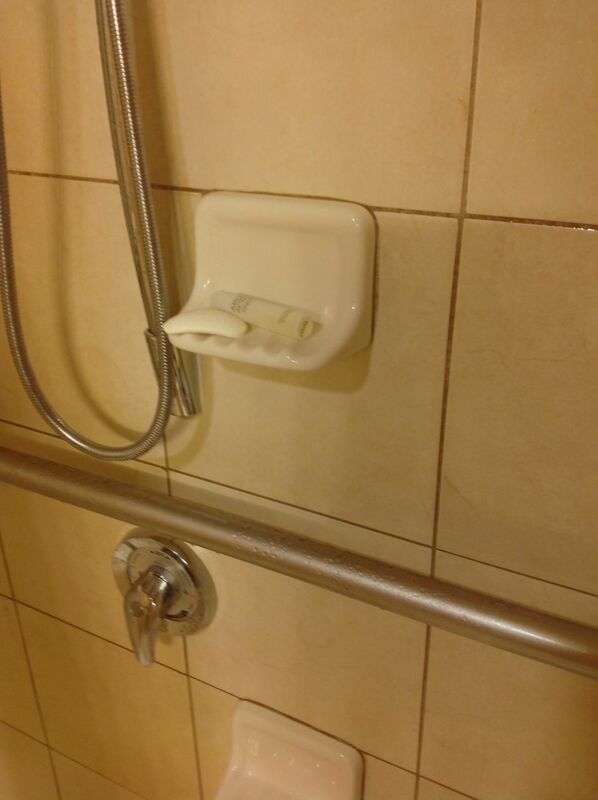 Adding a stationary shower head with a diverter would solve this challenge. Idea 2) Use recessed niches to increase space – It was nice that there were soap dishes mounted at 2 different heights (to accommodate someone in a seated or standing position), but this 60” x 32” area could have increased comfort and room by recessing the niches vs. having soap dishes which stick out into the shower. Check out the existing shower and another shower with a recessed niche. Idea 3) Use a weighted shower curtain or shower screen – After showering there was a good amount of water outside the rubber roll over water stop of the base. 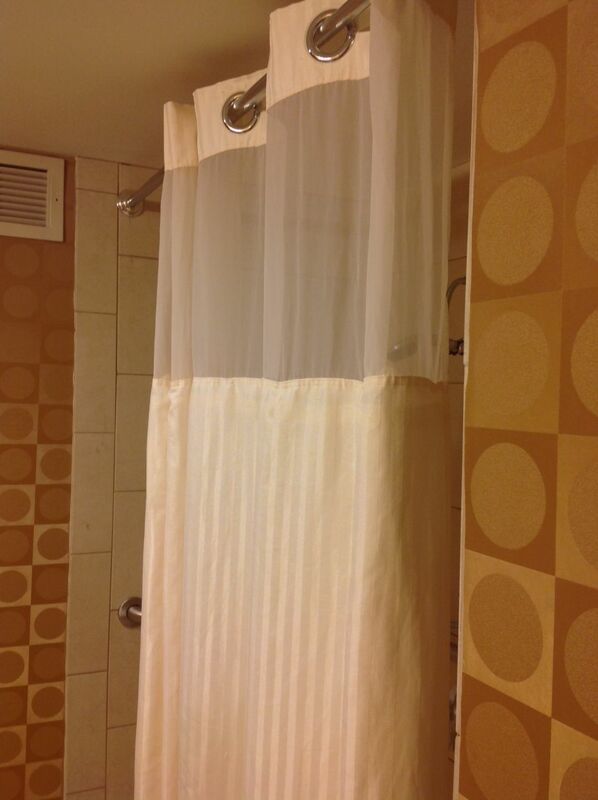 A weighted shower curtain could keep more water contained at a low cost. Another option would have been to use a pivoting shower screen – they look contemporary, keep the water in and still provide an opening suitable for a wheelchair. 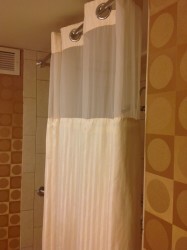 Below you’ll see the existing shower curtain being used an example of a shower screen. Idea 4)– Create a sleek wet room design – DoubleTree Hotels are very nice places to stay – but this mass market looking fiberglass shower base detracted from the bathroom design. In the initial planning of this property it would have be much sharper to use a product called a shower base former to create a one level (all tile) wet room. With this choice the shower could have looked sleek and cool and be completely functional for people of all abilities. 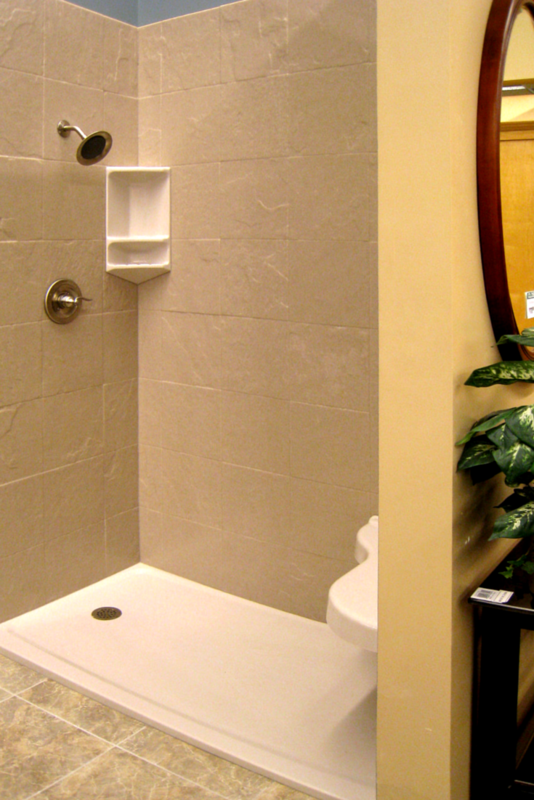 Check out difference in the look of the existing shower base vs. a wet room design. 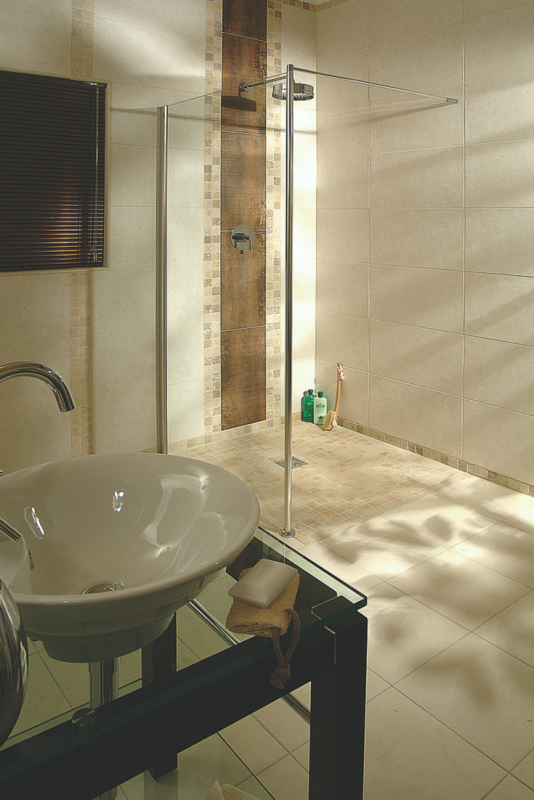 Idea 5) Consider grout free shower wall panels – While I have to say I personally love the look of a nice tile shower, the grout joints in a wet area are a maintenance challenge for the facilities department. 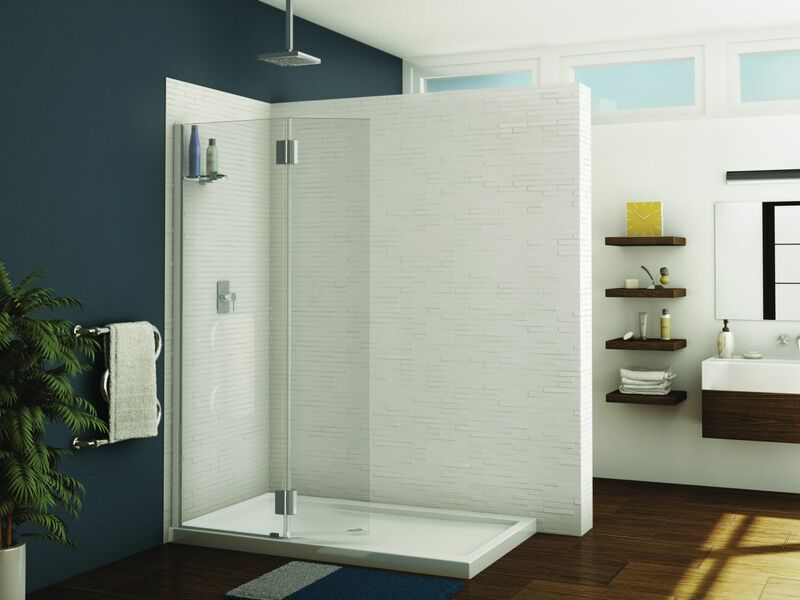 Two options to consider are using either solid surface shower wall panels or a sharp new wall system from Kohler called Choreography (this product was recently introduced at the International Builders Show and I thought it had home run styling and a thoughtful design). 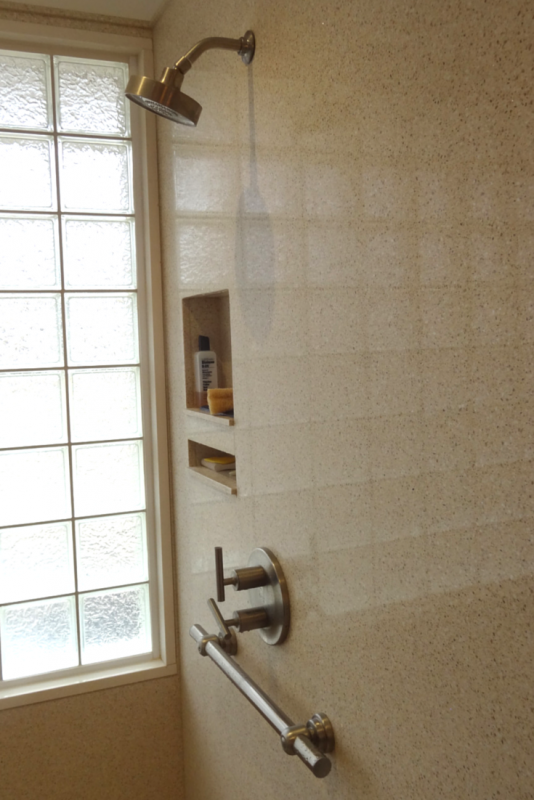 Shown below are the existing tile shower walls in this project and one grout free option – textured solid surface walls. Idea 6) Add a teak shower bench seat or towel bar – The current bathroom design does not have a place close to the shower to access towels to dry off – making it uncomfortable for someone in a seated position to roll over to the vanity and dangerous for someone in a standing position to walk over with wet feet to get a towel. A towel bar by the shower entrance or a teak bench seat would solve this problem. Idea 7) Get rid of the “hospital” grab bars – Nothing says “institutional” as much as the traditional looking grab bars. Using one of many lines of decorative grab bars can transform the appearance from being a “handicapped shower” to a “contemporary universal shower” even the most discriminating customers would enjoy. Check out the different between the current grab bars being used and the possibility of using decorative bars. What do you think of this shower design? 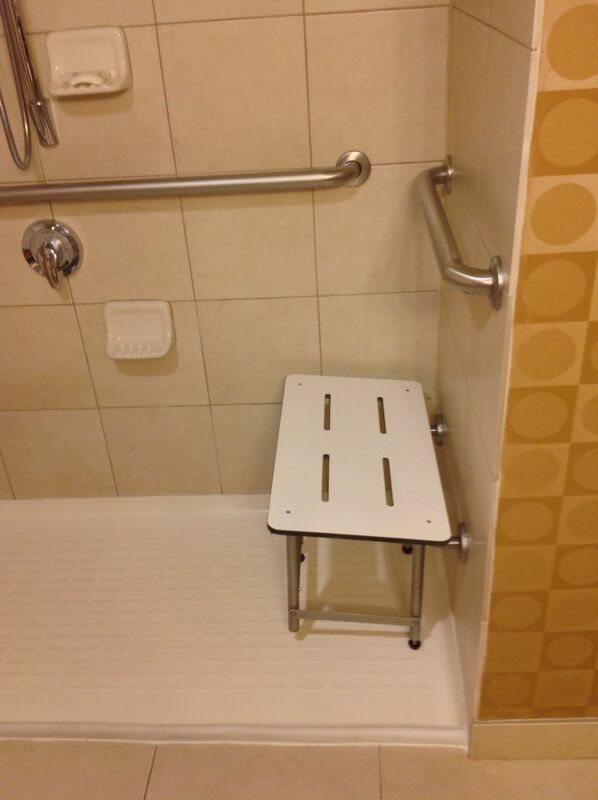 If you are someone who needs an accessible shower, or someone who does not need extra assistance, would you like this shower? Please comment below. 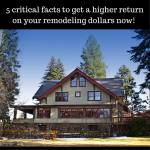 If you’re looking for more information or an estimate on remodeling a shower or nationwide material supply for universal and accessible design products call The Bath Doctor in Cleveland (216-531-6085), Columbus (614-252-7294) or for nationwide supply Innovate Building Solutions (877-668-5888).